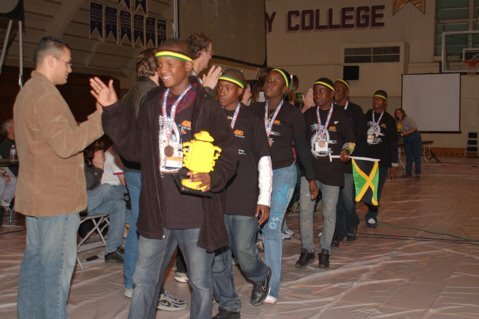 On a cold and rainy day in San Jose, Jamaica and the Caribbean's sole representative at the Northern California FIRST LEGO League arrived to compete with the top 64 teams in the state. After 3 rounds of robot missions in the morning segment, their highest score of 117 was not sufficient to rank. Dejected and disappointed, they did not know that destiny had other plans for them to make their mark.....make their loved ones and one love country, proud, and find greater pride in themselves and their lives. For the other participants, a team from Jamaica was a sweet novelty and many came over to greet them. A Jamaica national living in San Francisco, read about the team on the Internet and took time out to come and see them.....and even took a picture of them to take back as a memory. More than they realized, they were already being celebrated. In the afternoon, the team re-spirited to face the judging of their research presentation, robot design and teamwork ability. And so even as the weather remained cold, these 7 innercity kids from Jamaica warmed the hearts of the judges with their passion and song, about their lives and the robotics programme in their community. 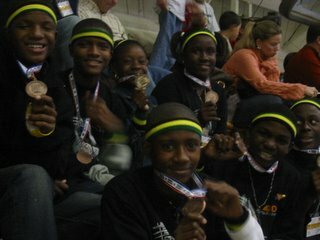 As we sat patiently awaiting the awards ceremony, one of the organizers asked me to introduce "the team from Jamaica". 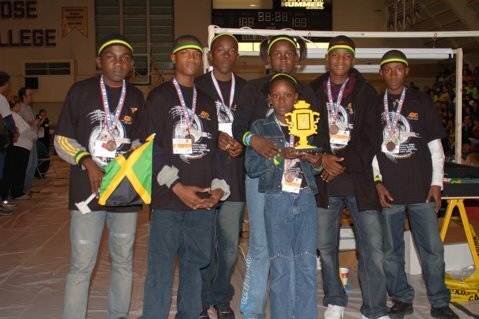 I introduced them as some of "the pioneers of robotics" in Jamaica and to the rousing applause of an gynasium filled with almost 2000 people, the kids stood and took their honours, in what I thought would have been their greatest triumph on that day. After announcing the awards for some 15 teams, they reached to the special Judges Awards. Not only are these awards only available at some tournaments, but they are also optional. Additionally, out-of-state teams are not normally eligible for awards at an out-of-state tournament as these are reserved for teams from within the state. We were out-of-country. The announcer begins to speak of award that was unanimous among the judges. One that they all got behind and said, "this the team should get it". An award for the team that "came the furthest and overcame the most obstacles to be at this competition......Halls of Learning LEGO Yuh Mind from Kingston, Jamaica!". It was our proudest moment yet. Such is the spirit of the FIRST LEGO League, 3 months from now they will forget what the robot did....but they will always remember the experience.Thank you Scotiabank. Congratulations! You did the Caribbean proud. Hope to hear more from you in this space as well. good work marvin--those kids must be really proud. Marvin, fantastic work man. Congratulations, you and the team really deserve it. Next time you gotta make your way down to Southern California. This is fantastic and truly inspiring! Congratulations to you and the kids. It is an experience that they will always carry with them. Congrats. Are there any recordings of that song? Congratulations! I wish I had known about this; somehow this slipped off my radar. If you want it, fire me an email with a mailing address, I'll send it. You have proven that it's more than just having 'potential' but rather mobilizing will power into action. Well done to you and your team! Marvin, you are marvelous! Glad to see you doing such great things. Good day Marvin, This is a good article site. I just read about this project on the Gleaner today and mi heart swell. Congrats man! and keep on going... we likkle, but we talawa. Keep up this great resource. Respect! I have to commend you on what you're doing. Not just inspiration to the kids, but for all of us to get involved as well. Nuff respect Marvin.